There are many weight management products on the market, and you may already be taking a Garcinia Cambogia or Green Coffee Bean supplement. However, after reviewing Garcinia Cambogia pills on the market, we found that many of these other products were lacking in quality ingredients or it was impossible to even find out where they were produced, or by who. Due to popular demand and feedback from our regular customers - who had reservations about the quality of their Garcinia Cambogia diet supplements, we looked to produce an affordable Garcinia and Green Coffee Bean product with ingredient quality that our customers could rely on. The quality of an ingredient refers not only to location and the manufacturer the ingredient is sourced from, but also the manufacturing processes and the quality systems in place. The quality of the finished product in turn depends on ingredient quality, and perhaps most importantly, it must be produced in a full compliance with GMP (Good Manufacturing Practices). Plenty of research is required to make an informed decision on a quality supplement, and we have made this process easier for you! No unnecessary fillers – This means that there should not be any additional ingredients listed. We have only used the highest quality Garcinia Cambogia and Green Coffee Bean extract, with a small amount of silica to aid in production and to ensure product stability. Garcinia Cambogia extract and Green Coffee Bean extract have been shown to be beneficial when taken in conjunction with each other. Other diet supplements with Garcinia cambogia often contain calcium, which interferes with the effects of HCA. Lab verified – The quality, identity, purity and strength of every ingredient must be verified by strict laboratory testing. Xtend-Life has tested every one of our quality ingredients through third party certified laboratories, using verified methods. Quality History – Xtend-Life is located in New Zealand and we have been producing quality supplements since 2000. We use stringent testing methods and uphold the highest standards. Manufactured under strict Good Manufacturing Practices (GMP) – This ensures that the manufacturing facility conforms to industry standards. This also ensures that every batch of product is produced according to strict processes and controls and that every step of every process is documented. Xtend-Life has produced this exceptional quality supplement containing the best Garcinia Cambogia extract and Green Coffee Bean extract so that you can have access to a genuine weight management product you can really trust. *Fillers are ingredients such as calcium, chromium, iodine, and potassium, which are used to bulk up the product and may interfere with the efficacy of the Garcinia ingredient. We believe that our Garcinia cambogia pills give you the best value for your money, where each serving (of three capsules) contains more than 700mg of HCA content and we do not use any fillers to bulk up our product. Our Garcinia cambogia supplement is proudly manufactured in New Zealand and we are confident that our choice of quality ingredients will lead to faster, safer, and more effective results. Garcinia Cambogia, also known as Malabar tamarind or Goroka fruit, contains an organic compound called hydroxycitric acid (HCA) that possesses several actions useful in helping to manage body weight. HCA is primarily found in the rind of Garcinia cambogia. It is a derivative of citric acid, but has very different properties. While the dried fruit rind is used extensively for culinary purposes in Southern India, Thailand, Malaysia and Burma, dietary supplements containing Garcinia cambogia extracts (with concentrated amounts of HCA) are popular additions to many weight management programs. There are several theories as to how Garcinia Cambogia HCA works. One theory for the mechanism of action of HCA is reported to be the inhibition of the enzyme ATP-citrate lyase. ATP-citrate lyase is a key enzyme involved in fatty acid biosynthesis, the body’s fat-making process, to turn excess sugars and carbohydrates into stored fat. When inhibited, this may affect the production of fats such as LDL and triglycerides, as well as the amount of fat converted and stored in the body. We source our Garcinia cambogia from a remote area in India, and the fruit goes through a 100% water extraction process (with no chemical solvents added) before being carefully dried in a vacuum environment. By performing the final drying phase under vacuum, the Garcinia Cambogia extract can be dried at lower temperatures to ensure its quality and efficacy is optimized. Did you know that there is a standard validated method for measuring Garcinia Cambogia HCA content? Other Manufacturers may choose to use a non-validated method to give them a falsely high HCA percentage; however, at Xtend-Life we only use the recognised and validated United States Pharmacopoeia (USP) Method. Xtend-Life’s facility is registered with the US FDA. We also abide by cGMP requirements for Raw Material testing for identity, purity, strength and composition. We engage third party laboratories to perform impartial testing of our ingredients to ensure strict compliance with these regulations. We have tested our premium quality Indian Garcinia cambogia extract and stand behind our HCA content. Do not be fooled by products that boast 70% HCA content or higher. While these may seem superior at a glance, it is important to take a closer look. The amount of HCA should be calculated into milligrams for the true representation. Here is an example of how to calculate the amount HCA in your Garcinia supplement. Read the label and establish the amount of Garcinia extract in milligrams (mg) per serving. Some companies mention the amount of fruit rind used - be sure to look for the amount of garcinia fruit extract. Once you have established the amount of Garcinia extract per serving, calculate the amount of HCA in milligrams. For example, if a company claims to have 70% HCA content, but only offers 1000mg of Garcinia per serving, calculate 70% of 1000mg. From the calculation we know that the product provides only 700mg of HCA a day. Xtend-Life’s Garcinia and Green Coffee Bean contains 1400mg of Garcinia cambogia extract (~60% HCA) and 70mg of green coffee bean (~40% chlorogenic acid) per serving. This means that you get 785mg of HCA from Garcinia extract plus an additional 28mg of chlorogenic acid from our green coffee bean extract! Green coffee beans are coffee beans that have not been roasted, but remain in their raw, natural form. While roasting coffee beans gives it its unique rich coffee flavour, roasting the beans causes them to lose chlorogenic acid - a vital beneficial compound present in raw coffee beans. Chlorogenic acid is a polyphenolic antioxidant present in green coffee beans that provides numerous benefits. Chlorogenic acid supports healthy inflammation management and is thought to help regulate the levels of glucose and LDL in the body. Chlorogenic acid can also aid the liver to better process fatty acids. We have added Green Coffee Bean extract into our formulation to further enhance the weight management properties of our premium quality Garcinia Cambogia extract. We source our green coffee bean from a remote area in India where it is grown in the shade in forests and hills away from pollutants and is pesticide-free. The dried raw beans are extracted, decaffeinated and spray-dried, resulting in concentrated chlorogenic acid that won’t keep you awake at night or feeling jittery. Xtend-Life has always stood behind the philosophy of health being a TOTAL package. This includes a healthy diet and lifestyle, adequate exercise and quality supplementation. Therefore, it is important that when taking a weight loss or diet supplement that you also review your lifestyle, diet, and general health as well. For best results with weight management and long-term health, Garcinia Cambogia and Green Coffee Bean is best taken alongside our Core Wellness Activators. Kiwi-Klenz – Adding Kiwi-Klenz to your weight management regime is crucial, as a healthy digestive system is important for ensuring proper absorption of key nutrients, as well as encouraging better elimination of toxins in the body. Omega-3 Fish Oil – Our top-quality Omega-3 Fish Oil is a unique blend of essential fatty acids which support healthy weight and inflammation management, as well as a large number of overall health benefits. Total Balance - Our food cravings are often a result of inadequate nutrition and Total Balance ensures your body gets all the essential nutrients it may be lacking from food. Healthy nutrition is one of the key factots to healthy weight management. While we are not promoting this product as a magic bullet for weight loss, you can be assured that this product contains Garcinia Cambogia extract and Green Coffee Bean extracts of the highest quality, to provide great support to any weight loss regime. Daily Serving: Adults – 3 capsules per day. Please take at least 30 minutes before breakfast, lunch and dinner with a full glass of water. Take at least 2-3 hours away from prescription medications where possible. Combine with our Core Wellness Activators for optimal support with overall health and wellbeing. 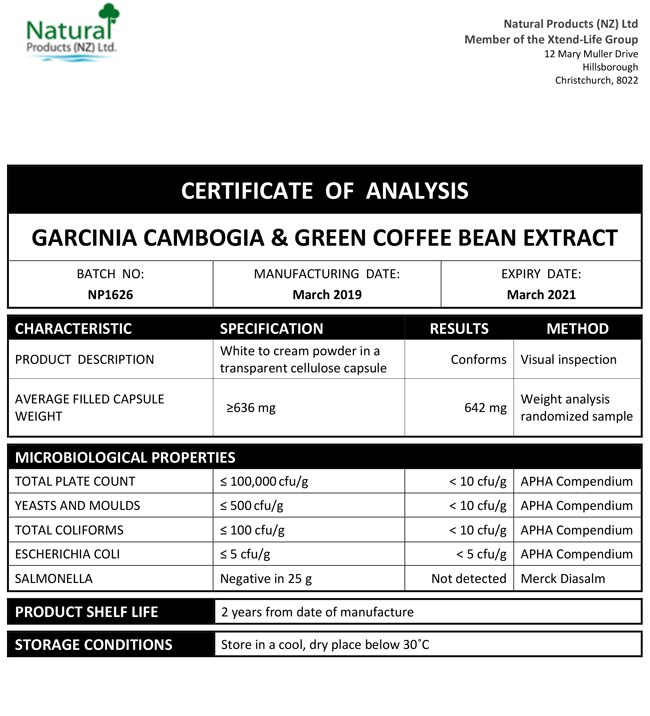 We have included below a copy of a typical Certificate of Analysis (CoA) for our Garcinia Cambogia and Green Coffee Bean product. All of the Xtend-Life Garcinia Cambogia and Green Coffee Bean products have the same formulation and standards. You will note that there are two columns which are headed 'Specification' and 'Results' respectively. The specifications are simply our minimum standard to which each batch of Garcinia Cambogia and Green Coffee Bean has to conform, otherwise we would not release it. The results are the actual results from the independent laboratory that did the testing. Why is Hydroxycitric Acid (HCA) effective in weight management? Hydroxycitric acid (HCA) has been shown to inhibit the enzyme ATP-citrate-lyase, which is a key enzyme in the body's fat-making process. The body uses ATP-citrate-lyase to convert excess sugars and carbohydrates from our diet into stored fat, which often leads to weight gain. When this enzyme is inhibited, it may affect this conversion and therefore the amount of fat converted and stored in the body. Can you tell me more about Garcinia Cambogia and what it is good for? Garcinia Cambogia is also known as Malabar tamarind or Goroka fruit which is often used for culinary purposes in South East Asia. Recently, Garcinia Cambogia has been used in dietary supplements after the discovery of an organic compound found in the rind of the fruit, known as hydroxycitric acid (HCA). It is this compound that delivers the weight management support properties Garcinia Cambogia has become known for. Can I take Garcinia Cambogia and Green Coffee Bean if I use prescription medications? Customer safety is important to us and we are aware that some supplements can interfere with certain medications. If you are taking medications, you should check with your medical practitioner prior to using this product. It is also best to take supplements and medications at least 2-3 hours apart. How soon will I notice results from taking Garcinia Cambogia and Green Coffee Bean? As with any naturally based product, every person will respond differently and the results will vary. However, when partnered with a healthy diet and regular exercise, you will hopefully experience some benefit over the first month. As Garcinia Cambogia and Green Coffee Bean has been shown to slow down conversion of carbohydrates to fat, individuals on a low carbohydrate diet may take longer to notice a difference. Is this product safe for pregnant or lactating women? We cannot recommend the use of this product while pregnant or breastfeeding. There has not been sufficient research on the effects of Garcinia Cambogia and Green Coffee Bean on pregnant or breastfeeding women. If you are interested in using this product while pregnant or breastfeeding, please consult your doctor. We recommend our Omega-3/DHA Fish Oil during pregnancy which is a rich source of Omega 3, especially DHA, which is essential for both mother and baby. Will this product help me to lose weight? This product certainly may help you to lose weight, but as it is naturally based it will work differently for every person. The success of this product also depends on many other factors such as diet, amount of physical exercise and other lifestyle factors such as stress. It is best used to complement a healthy diet rich in fruits, vegetables and fibre, as well as daily exercise. It is crucial to limit the consumption of high fat, refined and sugary foods as these are generally high in calories and low in nutrients, therefore not at all conducive to a weight loss plan. Those eating a diet high in carbohydrates may experience results quicker, due to the action of HCA on carbohydrates. If you consume a low carbohydrate diet results may be slower. The length of time to see results will vary between individuals as well. It is best to take this product for a minimum of two to three months in order to gauge how it is working for you. Can Garcinia Cambogia and Green Coffee Bean be used on a long-term basis? Yes, it would be safe to take long term. However, this should not be necessary as this product is best used to support a weight management regime over a period of a few weeks or months. Once the desired weight loss has been achieved the dosage may be reduced to one capsule per day or even one every second day, as a maintenance dose. It also may be stopped altogether once the weight has stabilized. What is the minimum age that Garcinia Cambogia and Green Coffee Bean can be taken? Commonsense applies; this product should not be used by children under the age of 12 years old, as ideally it would not be needed. If a child of this age is struggling with their weight the best course of action is to make positive changes to the diet and lifestyle. Garcinia Cambogia and Green Coffee Bean may be safely used by those of adolescent age, but again it should not be necessary. This product is best recommended for those aged over 18 to compliment an overall weight management plan, in which a healthy diet and regular exercise are central. How do you calculate your HCA content? Read the label and establish the amount of Garcinia extract in milligrams (mg) per serving. Some companies mention the amount of fruit rind used - be sure to look for the amount of Garcinia fruit extract. Once you have established the amount of Garcinia extract per serving, calculate the amount of HCA in milligrams. For example, if a company claims to have 70% HCA content, but only offers 1000mg of Garcinia per serving, calculate 70% of 1000mg. From the calculation we know that the product provides only 700mg of HCA a day. Xtend-Life's Garcinia and Green Coffee Bean contains 1400mg of Garcinia Cambogia extract (~60% HCA) and 70mg of green coffee bean (~40% chlorogenic acid) per serving. This means that you get 785mg of HCA from Garcinia extract plus an additional 28mg of chlorogenic acid from our green coffee bean extract. Will I notice any side effects when using Garcinia Cambogia and Green Coffee Bean? Garcinia Cambogia and Green Coffee Bean can be used safely by most, with only a few studies siting minor side effects such as nausea, stomach discomfort and minor headaches. If you are concerned, discuss this with your medical practitioner prior to using this product. You may also prefer to slowly introduce the product starting with one capsule a day, before increasing the dosage to the recommended level of three capsules per day over a period of a week or so.